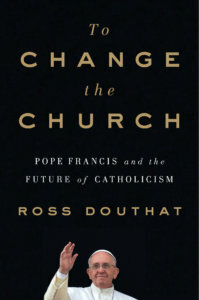 “To Change the Church: Pope Francis and the Future of Catholicism” by Ross Douthat. Simon and Schuster (New York, 2018). 235 pp., $26. New York Times columnist Ross Douthat has become one of the leading Catholic commentators on the Francis papacy, and this book, being released around the papacy’s fifth anniversary, serves well as both an overview of the pope’s accomplishments and a sometimes critical commentary on them. Douthat’s treatment rests on two main ideas. One is the claim that the proper framing of the papacy is neither a liberal nor a conservative one, but instead should reflect unresolved tensions in the church that date back to the Second Vatican Council, and in fact are written into Vatican II’s documents themselves. In this sense, the Francis papacy has brought out into the open certain challenges that probably had to be engaged. But Douthat’s second idea is that, in reference to meeting these challenges, there are really two competing Francis papacies. One took center stage in the first couple years, and highlighted Francis’ pastoral brilliance and sensitivity, his Christ-like public presence and his insistence on the urgency of the church’s teachings on social issues like immigration and the environment. Douthat sees this version of Francis’ papacy as “less a revolution than a rebalancing,” and a unifying one that had the potential to overcome those latent tensions. However, a second Francis papacy emerges out of the contentious debates and ecclesial politics surrounding the 2014 and 2015 synods on the family, and the subsequent papal document, 2016’s “Amoris Laetitia.” In these, rather than unifying, underlying tensions have been exacerbated. In part, the problem has to do with a simple inability to find a common ground on particular issues (e.g. Communion for the divorced and remarried), which Pope Francis (on Douthat’s reading) has handled poorly by being vague at some times and definite at others. But beyond this, the particular controversies have turned into an occasion for more extreme Catholics from both poles to advocate either for much more sweeping change or for an even deeper “traditionalist” retrenchment against the possible mistakes of Vatican II. The fact that some highly placed church leaders, close to the pope, seem to advocate one of these poles as a “new paradigm” is the central concern Douthat has in worrying that this will all end badly. Moreover, Douthat presents reasonable evidence that the synod impasse frustrated Pope Francis personally to an extent that his internal leadership style became more impatient, imperious and conflictual. The book is certainly the best extant treatment of the state of the Catholic Church in the Francis era. It is readable, broadly accurate and (while Douthat clearly has a point of view) reasonably fair in its treatment of the events. And Douthat’s suggestion that Pope Francis is a “proto-populist” in both his successes and failures probably draws too strong of an analogy between the church and the political scene. Further, while some attention is paid to the chronic problem of internal Vatican reform — the chief reason for Pope Benedict XVI’s resignation and the conclave’s desire for a strong outsider administrator — the story of the papacy here is seen primarily in terms of its teaching authority and episcopal appointments. Yet Douthat’s creative appropriation of the Jansenist-Jesuit conflict of the 17th century as an instructive, complicated analogy to present questions is quite thought-provoking. And his more passionate worry — that the second, divisive Francis is “missing Catholicism’s opportunity” to stand up for a unified synthesis of human dignity, religion, family, and social solidarity in a world beset by bad politicians and irrational polarization — is one worth hearing for those both inside and outside the church. It is this final plea that distinguishes Douthat’s work from both Francis’ usual supporters and critics, offering instead a nuanced if cautionary account of this very much unfinished tale. Cloutier is a professor of moral theology at The Catholic University of America in Washington and the editor of the group academic blog, catholicmoraltheology.com.